As a blonde Essex girl with Welsh roots, I’m pretty much every joke in the book! I’m proud of all of my heritage but I also love the city in which I grew up. My parents moved from Essex to the countryside in Nottingham when I was two years old and I feel lucky to have been brought up in this lovely county. 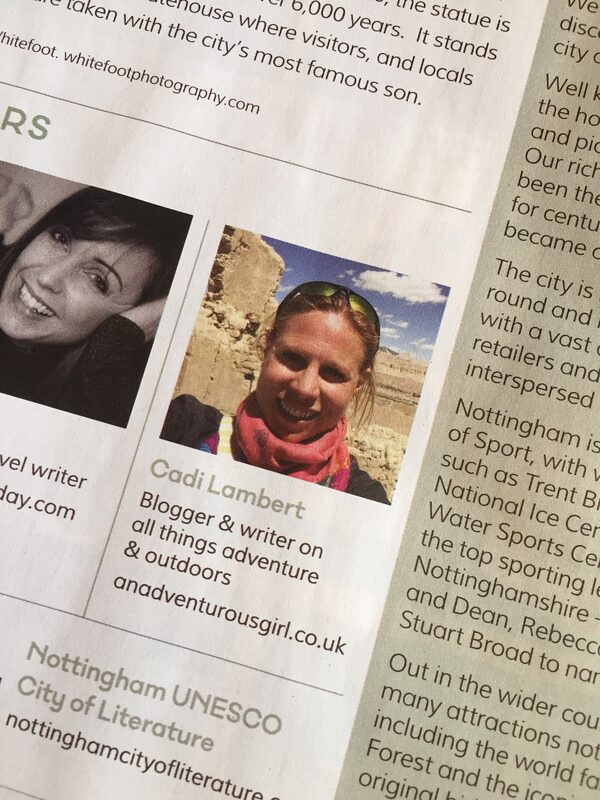 So, when I was asked to contribute to the latest tourist guide for Nottingham and Nottinghamshire I jumped at the chance. I love to inspire others to get outside and explore. As important as it is to me to travel, I also love discovering more about my near surroundings. Take for example the day I heard about the Park Tunnel, in the centre of Nottingham. This fascinating tunnel is a great way to surprise visitors and Notts residents alike. Its entrance from Derby Road is accessed by seemingly heading into a private underground carpark! If you haven’t discovered it already go and find it soon. I was contacted by Experience Nottinghamshire after they saw a previous blog post describing a walk from Newark. We agreed that I would write some walks and cycle rides to help people to explore Nottingham. I had a fantastic time re-exploring Nottingham and am so proud to feature in the smart guide, which you can view here. As space was limited in the guide, the full details of my walks and rides could not be included. So below is your chance to find out more about the places I love in Nottinghamshire! Growing up in the Trent Valley gave me an appreciation of the villages the river wends its way past. I chose to focus on this area for the walks. Despite knowing the area well, I felt I should re-walk all of these trails to write them up accurately. Enlisting Jamie, Dad and Sprite the dog to help me, we rediscovered some great paths. The three walks I wrote up were from Hoveringham, Bulcote and East Bridgford. They are all between 4 – 5 miles in length and I hope they capture some of the history of the area. You can download a PDF of all three walks here. Exploring the county on two wheels is a fab way to see so much more of it. I have road, hybrid and mountain bikes and wanted to write up rides which reflect this. When I was training for my Coast 2 Coast in a Day ride I often plotted long solo routes. Pretty Villages was one of my favourite inventions. When I rode it the first time I made it into a 60 mile route but, for the guide, it has been shortened to a, more manageable 30 miles, from Southwell. Also included is the Sutton Bonnington loop. A route which takes you to the south-west reaches of the county. Finally, the (mainly) off road option; Canals and Rivers. This allows the cyclist to explore the delights of the River Trent and Nottingham and Beeston Canal. I felt this took in both rural and industrial Nottingham in equal measure. You can download a PDF description of all the cycle rides here. I also wrote a piece on one of my favourite towns in Nottinghamshire. Southwell is so filled with history and interesting facts that I barely knew where to start. I’m sure that my affection for it is influenced in no small way by the fact I went to university just up the road; studying Equine Science at the Nottingham Trent University Campus at Brackenhurst. You can find my guide to Southwell on page 41 of the visitor guide. The Visit Nottinghamshire guide really is packed with lots of ideas for discovering more about the city. You don’t have to be a tourist to use it. I found out about lots of new places in my copy. You can grab a printed copy from a tourist information centre, view the PDF online or download a copy right here. I hope you enjoy exploring Nottinghamshire as much as I do! I imagine how wonderful it would feel to officially write about your hometown as a formal representative, to write an introduction to the city’s beautiful neighborhoods and places that make teh city special. A great honor, it should be. Congrats!